There are many charcoal smokers on the market as there are gas and electricity too so why would you choose to buy a charcoal fired unit over and above one of the other options? A clean and efficient burn. To all intense and purposes, charcoal smokers are running almost on pure carbon (assuming it's a good quality charcoal) so it burns really efficiently and can be used to get good high temperatures if necessary. No need for additional smoke generating equipment, just add pre soaked wood chips onto the fire and you'll get all the smoke you need. Playing with fires is fun (well at least I think so). Don't ask me what it is but there's something fascinating and primitive about using what is one of the oldest cooking methods known to man. A charcoal fire really needs to be lit in a metal or brick enclosure therefore the material cost for the firebox is going to be expensive. Especially so if you're going to think about a ceramic kamado grill. Heat is controlled by the oxygen flow ie. The draft created by the vents top and bottom. Any change in the available draft will change the temperature albeit only after a lag phase. 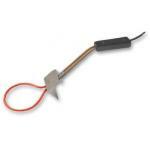 This makes immediate temperature control difficult and therefore set up times can be longer. Because of the lack of immediate control, regular tending is necessary to make sure that temps don't drop or shoot up (it can do so in less than 20 minutes) otherwise a whole smoke session could be ruined. The best way to ensure that you don't have this problem is to use a charcoal chimney burner to ensure that any coals you add to the firebox are already up to speed and ready for action. Petroleum based lighting aids can taint the food if all the product hasn't combusted prior to cooking. For this reason I steer clear of lighter fluids and gels and generally use an odourless firelighter. If you want to be super pure then the other option is an electric charcoal starter. There's more work in clean up. When the fire has cooled, it needs to be cleaned out and this isn't always first thing on your mind. It really does have to be done if you keep a metal smoker externally because charcoal ash is acidic and if mixed with water (from rain) it will act to corrode your equipment. It must be noted that this page was written independently before I started to manufacture my own range of charcoal smokers. Naturally I'm biased but it was the process of critiquing other products that directed me to my own designs and for that reason I think this page still worth reading. 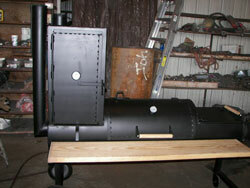 It's a versatile two-chamber design and can be used as either a grill or a smoker. Equally it’s fuel source can be charcoal or wood via the offset firebox. Although it is somewhat heavy (weighing in at 130 pounds) this is primarily down to the sturdy format of it’s structure – built to last. There are some very nice design aspects here, both the firebox and the smoking chamber open fully for convenient access, thanks to their sturdy hinged lids and angled smokestack design. I like the fact that the porcelain-coated, adjustable grates fit both chambers and there's plenty of cooking space too. The grates separate into smaller pieces thereby making them easy to clean in the dishwasher or kitchen sink. Likewise the grate in the smoker box is also relatively small and easy to remove. The temperature gauge appears to be acceptably accurate too. A small downside is that the wheels (made of plastic) are not that durable and will soon need re-placing (I suggest replacing them with wheels made of a stronger material than can support the weight as the unit is transported). The Smoke King Deluxe is a combination charcoal grill and smoker although being upright in design leaves it somewhat lacking as a grill. Can't argue from a space saving point of view though. If you have a preference for vertical charcoal smokers then you’ll have to go a long way to beat this model in terms of durability and construction. Temperature control is good (top and bottom adjustable draft vents as you would expect) but the lack of a smoke spreader does mean that there is a tendancy for both smoke and heat to go up just one side of the tower. You may want to look at the thermometer and think about replacing that too as questions have risen to the accuracy of the one included with the unit. It can also be on the heavy side when it comes to burning charcoal or briquettes. That all said, you can get an excellent ‘smoke ring’ so on balance there's positives too. A durable space saver with the ease of access that you typically don't get with a bullet smoker. Another of the “bullet” shaped charcoal smokers it comes with either a single or double rack that takes a food capacity of 25 and 50 lbs respectively. The Smoke N Single is made out of porcelain coated iron, doubles up as a grill and at 22lbs in weight is really portable. To be fair, this makes a really good unit for anyone starting out. The main additional feature in this model is the double rack that allows you to smoke up to 50 lbs of meat at any one time and for the privilege this will set you back an extra $25 or so. You also get a temperature gauge which normally I would say is essential but in this case read "a waste" because it only reads warm/ideal/hot. Your best bet is to buy the cheaper version, drill a hole and insert a "tell tru" gauge. You also get a vinyl cover to protect your smoker when you are not using it and again you can have any color provided it's black! Top of the range is the Gourmet Smoke N Grill and again with this unit you get 2 racks and 50lbs of food capacity. The all important (and still useless) temperature gauge is also there together with a front hinged door. The distinction that sets the Gourmet apart is the handy separate base pan design that makes set up much more convenient. And for the color conscious amongst you this unit is available in green as well as black. 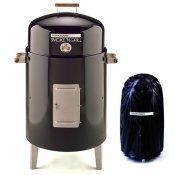 These charcoal smokers are cheap and that is reflected in build quality, you'll get a couple of seasons out of one and then you'll need a new one. Couple that with the fact that offset charcoal smokers (whilst they look good) are notoriously challenging to tend, they really are designed for the purist and enthusiasts so what's the point in a cheap offset smoker? 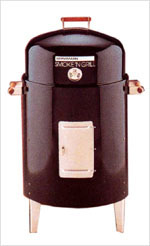 If you're a newbie to smoking and want to ease your way in at low cost then buy a bullet smoker. If you're a serious enthusiast, you're probably going to want something much bigger and more robust. This is effectively a larger version of the American Gourmet and as such it gets the same verdict. If you're on a budget and starting smoking for the very first time then this isn't the best place to start and it won't last forever. It always pays to get a charcoal smoker with the thickest metal that you can afford because this will improve temperature stability and you won't burn a hole in the firebox. This unit has little to commend it. Compare that to the Horizon charcoal smokers below and you'll see that you get what you pay for. Offset firebox design provides multiple cooking options. 738 sq. in. total cooking surface area. Let’s be up front here. The New Braunfels smokers (Hondo) are actually now part of the Char-Broil range of smoker and grill family. What was once a large range of Hondo Smokers has now been reduced down to only two that are available to buy (according to the website) from new owners Charbroil. 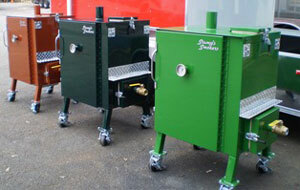 They are the Hondo Junior Offset Smoker and Hondo Offset Smoker respectively but would you really want to buy one? Sad to say but the general consensus out there from the more experienced barbecue enthusiasts is that although the new version from New Braunfels was an improvement over their earlier version (see note below), now that the manufacturing has been taken over by Char-broil no further improvements have been made (ok, I admit they added their own handles). In fact a number of models dropped off the radar altogether. ‘Each and every model of the original New Braunfels smokers were better’, said one critic to me. The changes made by New Braunfels themselves were to upgrade from what everyone agreed was ‘a very flimsy smoker with several bad design features’ to something ‘heavier and much better designed with cast iron cooking grates instead of the thin porcelain coated wire grates’. Not really important but of interest none-the-less is that the New Braunfels Smokers use the same grates as an old (Char-broil) Eldorado. One of the most annoying features (or non feature) is the lack of temperature gauge. If you already own one of these units, a good tip I came across was to buy a thermometer of the type that you can use through the hole in the pit – as you always need to know what the temperature is. These units were pretty good for ‘newbies’ who don’t want to shell out a fortune then but given the less than rave reviews I don't think that they will be sorely missed. Renowned for high quality stainless steel grills Fire Magic include a smoker oven option in their range ideal for slow smoking meat, poultry or fish. The Smoker includes a warming rack, adjustable air shutters for controlling temperature and smoke plus an analogue thermometer fixed to the front. Recommended by numerous cooking magazines and well known television chefs here we look at the 16 inch Classic and the 20 inch Special Marshall (there are others in the range too). 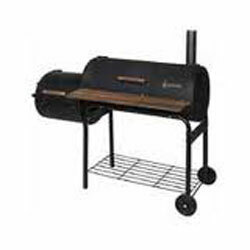 A smoker is bought with Horizon’s name on it because it is quality manufactured at the very same factory that gave birth to the by now legendary Oklahoma Joe charcoal smokers. The double damper system makes it easy to regulate the temperature that you can vary from as low as 160 degrees for that slow smoking effect, through 250 degrees for perfect barbecuing right up to 325 degrees for the full grilling experience. It looks and is solidly built in the USA. 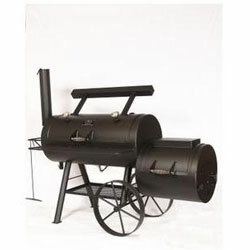 It comes fully assembled and is constructed from the very best high quality steel materials with the smoker body itself built from quarter of an inch thick structural pipe. Solid as a rock, there is a 10 year warranty on the welding structure, and a lifetime on the burnout of the firebox. In fact I have only one complaint.......why oh why is there no temperature gauge on the 16 inch Classic? These babies are made from strong stuff so the only piece of advice I can give you is "buy the best one that you can afford". Cooking chamber dimensions are 16” diameter & 32” long. 660 square inches of cooking surface. Clean out tool for to clean out ash from the cooking chamber and firebox. Clean out tool for easy clean up of the firebox. If Elvis was the King of Rock and Roll then David Klose is the King of charcoal smokers. He has been hand-making Klose Smokers for decades and you'll find many of his custom units there at some of the biggest cook-offs. Okay, they aren’t cheap (your often looking at a price tag of in excess of $1,000) but you pay for what you get. The 20 by 30 inch unit (maybe a snappier name, David?) is what he calls ‘the Owner Recommended’. A traditional smoker constructed from nothing less than 1/4 inch steel that has been precision welded and then, get this, painted 5 times with 1300ºF paint. It will not rust or corrode. The large capacity firebox has a 20 pound removable ash tray and the whole unit is so well vented that you can be happy to more or less just ‘fire her up’, walk away and let her practically tend to herself. No temperature spikes or dips to concern yourself with either. With a Meco Smoker it really is a question of getting what you pay for. They are cheap and are cheaply made. Putting the manufacturer’s spin on it - it might be kinder to say that ‘They are affordable and come in all shapes and sizes; one to fit every patio and budget’. In fairness a number of competitors are of the same ilk. Having said all this the available reviews are mostly positive with a good number of satisfied customers recommending them. All models are of the "bullet" style design, which is to say that they are cylindrical in shape with a dome lid. They are made out of poor quality metal so they do require a lot of attention during the cookout to keep the temperature under control. Most are charcoal but there is also an economical electric version. I guess that it's horses for courses, if you want low cost the Meco smoker has to be worth due consideration. 120 volt / 1650 watts. Constructed of heavy-duty steel the 20 in. 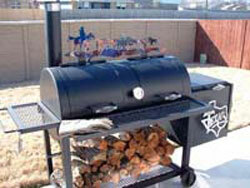 Oklahoma Joe Patio Offset Smoker from the Oklahoma Smoker range is built to last. Watch out though - assembling one of these charcoal smokers is definitely a two man construction job so allow for this when you get it back to the ranch (also there’s a lot of packaging that you’ll need to arrange to dispose of!). The unit includes a smoking chamber and a stainless-steel front shelf that provides a grand total of 1,045 sq. in. of cooking space. Features include that all important built-in temperature gauge for effective, even cooking, a removable ash drawer for easy clean up and a firebox door (that comes attached to the smoker) with easy access for filling. A bottom metal shelf adds that extra space and cool-touch handles provide a necessary safety factor. One small negative: This particular Oklahoma Smoker doesn’t come with a cover and it’s quite difficult to find one that fits. 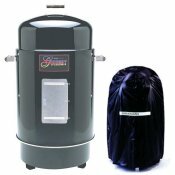 These charcoal smokers deal for large family gatherings and parties and does wonderful barbecue pork ribs. Cooking Area 1,045 sq. in. Well, what can you say about a company with a motto ‘STUMP DON’T BUILD NO JUNK’? I would have thought it sufficient to say that you ‘produce some of the finest upright smokers, trailers, and grills in the market today’! Support this with a company ‘goal’ of providing the best workmanship and designs available and then tie the whole thing up in a pretty bow and that should do the job. If you ever needed a testimonial then the fact that these units have been responsible for producing over a 150 champions in the past few years at various barbecue contests across the USA should do nicely! 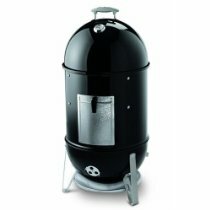 Stumps smoker range includes backyard and trailer mounted charcoal smokers but here I am talking about their upright smokers. Stumps have come up with an impressive gravity feed system that has a charcoal chute linked to an insulated burner box. As the charcoal in the burner box burns off all you have to do is open the chute door and add more fuel. Use your own wood to the ‘flavor generator box’ to produce your own favorite tastes. A dedicated valve and ‘high-quality thermometer (on the door) gives dream precision heat control. On average each vertical smoker maintains ‘an hour burn per pound of charcoal at 225 degrees’, not bad, but not as good as a kamado but then these units hold a darn sight more food. The interior of each unit is solid welded 16 gauge metal and has a computer generated framing system for maximum support. Each door features an easy close and lockable latch system that is sealed tight with a high temperature tadpole gasket to contain the heat. A final good point. Easy to clean. 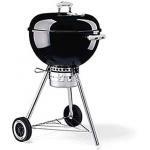 Weber offer a limited range of charcoal smokers but all offer extremely good value. Most BBQ enthusiasts will be familiar with the low cost Smokey Joe® portable grill but Weber® also offer the Smokey Mountain Cooker™ Smoker. Many of the products on this page are available for purchase through our online store. It's set up through Amazon because we all know that this means rock bottom prices and safe, secure purchase transactions with the goods delivered direct to your door. Until recently, Weber charcoal smokers were black and only black so if you spot someone cooking using a black sphere on short legs then the chances are it’s a Weber® Smokey Joe®. OK it’s not quite spherical but I hope that you get the picture. 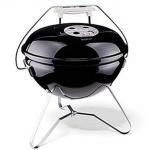 The Smokey Joe is essentially a portable grill that when used with the lid on can do the job of a smoker. It has vents in the lid to give elementary control over the speed of cooking and a black porcelain enameled base. It is available in two specs, silver and gold, the only difference I can spot is that the gold has a lid lock for carrying that also doubles as a lid holder. If you now know what a Smokey Joe® looks like, then these Weber charcoal smokers are just bigger and have taller tripod with wheels to make this more of a backyard BBQ than portable grill. 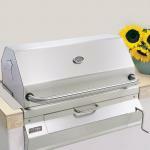 Again you can grill or do a basic smoke with the lid on and the One Touch® comes in two specs (silver and gold) and two sizes making a complete range of four. The difference between silver and gold is essentially that the gold has a removable ash collector that sounds pretty useful. 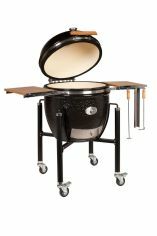 The sizes options are either a 18.5 inch diameter cooking area or a 22.5 inch diameter. Again available only in black, this contraption looks like an up ended torpedo. Just like the Smokey Joe®, Weber make this out of enameled porcelain to include the bowl, lid and water tray, the fuel door and vents are aluminum. There are vents both top and bottom to allow for the necessary control of the fire when smoking. Food wise, inside the smoker are two trays (one on top of the other) so there’s a reasonable amount of cooking space although the lower rack is pretty close to the coals so I’ll reserve judgment about how to get perfect results on both racks simultaneously.